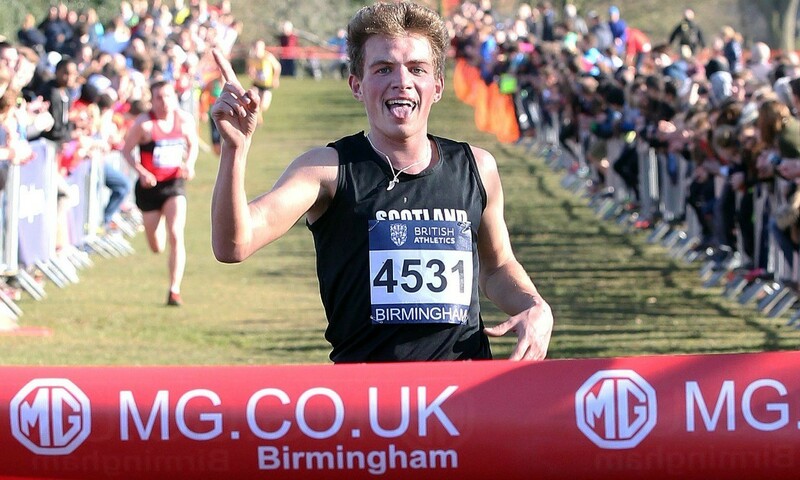 Andrew Butchart and Lily Partridge took the senior victories at the Inter-Counties Cross Country Championships in Cofton Park in Birmingham on Saturday. Partridge followed up her National win last month by defending her title, holding off a strong race-long challenge from 2013 winner Louise Damen to cross the line three seconds clear. These two were on their own neck and neck for most of the three laps before the in-form Partridge moved away half way round the last lap. Sarah Astin duplicated her third place from the National with another bronze, just pipping a resurgent 43-year-old Michelle Ross-Cope. In the senior men’s event, 12 were still in the main pack 20 minutes into the 34-minute long race before three suddenly broke away. It was then that the respective cross-country champions of Scotland, England and Wales battled it out. By the end of the third lap, Dewi Griffiths, who recently took a fourth consecutive Welsh title, and Scottish winner Butchart were two seconds in front of Charlie Hulson, a Welshman who won the English National. With around 1500 metres remaining, Butchart pulled away to form what would become a seven-second margin. Griffiths held on for third from Hulson. Unusually the Inter-Counties were the World Cross Country trial race for only the juniors as British Athletics have controversially said they are unlikely to send full teams to Guiyang. Joe Steward and Phoebe Law led the junior races, from which the first three will be offered automatic selection for the World Cross. Steward was three seconds ahead of Jonathan Glen as Elliott Bowker and Christopher Olley were third and fourth. Jac Hopkins, one of the pre-race favourites, pulled out midway with a calf injury. Law pulled away in the final kilometre from Harriet Knowles-Jones, who crossed the line second but was disqualified as per British Athletics rules for not wearing a chip. Therefore, Bronwen Owen and Hannah Nuttall took silver and bronze and the other automatic places for Guiyang. In the age-group races, Ethiopian-born brothers Mahamed Mahamed and Zakariya Mahamed took the under-17 and under-15 titles respectively, while Tommy Dawson won the under-13s. Euro Cross trial eighth-placer Sabrina Sinha, who would surely have strongly challenged for a World Cross place if she had opted to run with the under-20s, won the under-17 event after pulling away over the last 1500m from eventual runner-up Niamh Brown. Kathleen Faes built up a decent lead early on in the under-15 race and held off the gaining Josie Czura to win by six seconds. In the under-13 race, Olivia Mason and Agnes McTighe were out in front on their own from early before Mason pulled away for a four-second win.